Okay - after further refining my plans I'm off on this new long hike. 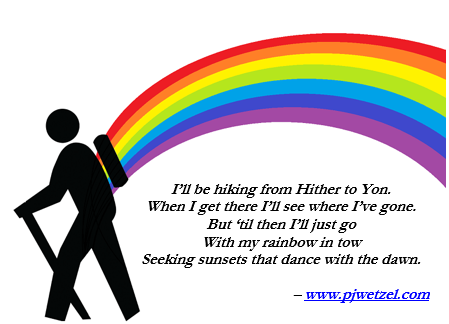 I'm calling it the hike from Hither to Yon because it's part of a long continuous path that will truly meander across the United States and perhaps beyond, but it is such a long way that I can barely dream of finishing. In stead, as the Limerick says, "I'll just go." When I have to quit because of winter or health crisis or simply on a whim, then that will be my destination - my "Yon," which is short for yonder. And be-yonder lie my dreams. The true 'end' of this hike is a place where sunsets dance with the dawn, or dance until dawn - land of the midnight sun. Perhaps Alaska. Perhaps the shores of the Arctic Ocean. Where is "Hither"? Well, check out the track. 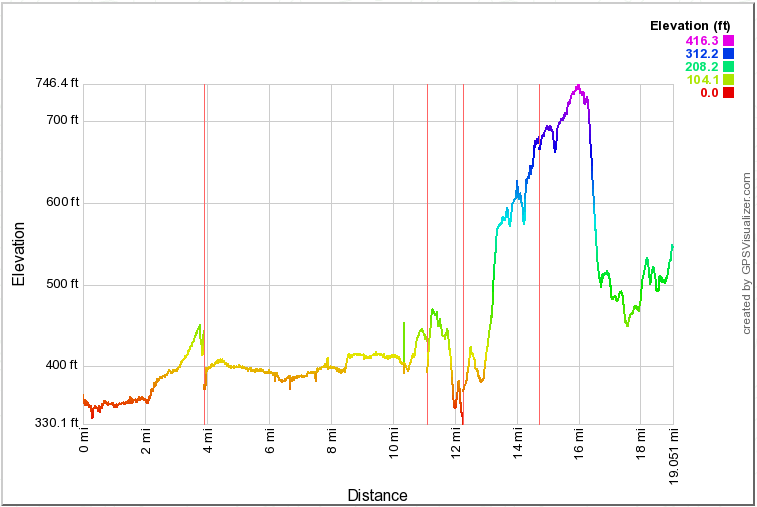 I'm including these screen-shot tracks and elevation profiles from now on in case the EveryTrail site fails me. It seems to be owned by a company that doesn't care about it and barely maintains it. There have been lots of outages lately. The "Hither" is Dam 5 on the C&O Canal Towpath. That is where I left off on my last hike in a series starting at the Appalachian Trail (AT). This is the latest in my over-arching Personal Continuous Footpath trek aimed at connecting my footprints to all the places I've ever lived. So the immediate destination is Penn State University, where I lived from 1966 to 1970. Today's hike was 19.051 miles in length according to my GPS track, and it covered pieces of five named long-distance trails. The first two are 'umbrella trails' that piggy-back on big parts of other trails. Regarding the American Discovery Trail (ADT), I'm having a stormy affair with it. In my last post I was thinking of it as the backbone of my hike westward, and was hoping to complete this entire 4000 mile plus trail. But when I discovered that it requires ferry boat rides across the Ohio River and San Francisco Bay, its allure went way down. I can't use ferry boats to connect a 'continuous footpath'. It's just my rule. My last hike, from the AT to Key West, made use of the southern end of the Great Eastern Trail (GET), and I've personally met the first person to thru-hike the GET - Joanna 'Someday' Swanson. (Met her in the 'Roller Coaster' on the Appalachian Trail). Best of all, the GET is a foot trail, not for bicycles like the ADT is and like the C&O as well as the WMRT. The Tuscarora Trail is a foot trail too. 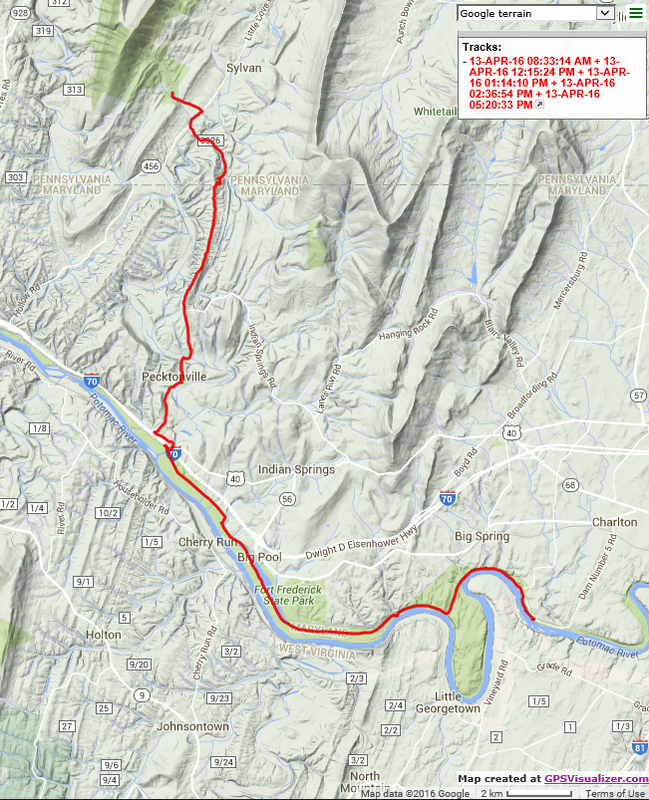 It was built as an alternative to the Appalachian Trail and connects to it at both ends (Central VA and central PA), but I'm just using about forty miles in the middle of it as a connecting trail. Okay, enough of the logistics. What did I see today? Lots! Too much to cover in this blog, so here are the highlights. I'm still trusting EveryTrail with my full slide show as I have since I started my Appalachian Trail hike in 2012. So go there to see the rest. It started with a glorious calm morning above Dam 5. Here's the turbine house and its near perfect reflection in the calm waters above the dam. Dam 5 was built to tame the Potomac and allow the barges to leave the canal and use the river to get around a section of sheer cliffs where it would have been tough to dig a canal--easier to dam the whole river. 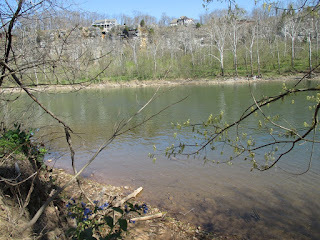 Here's the towpath beside the cliff. There were cliffs on the other side in places too. The houses perched here have unique views. In another area called Big Pool, the canal is replaced by a regulated lake, given that name. It's more than a mile long. I passed a picturesque old mill called Charles Mill. The creek runs right under and through the old stone building. And I passed through Four Locks, which has four of the old canal locks all strung together in a tight series. 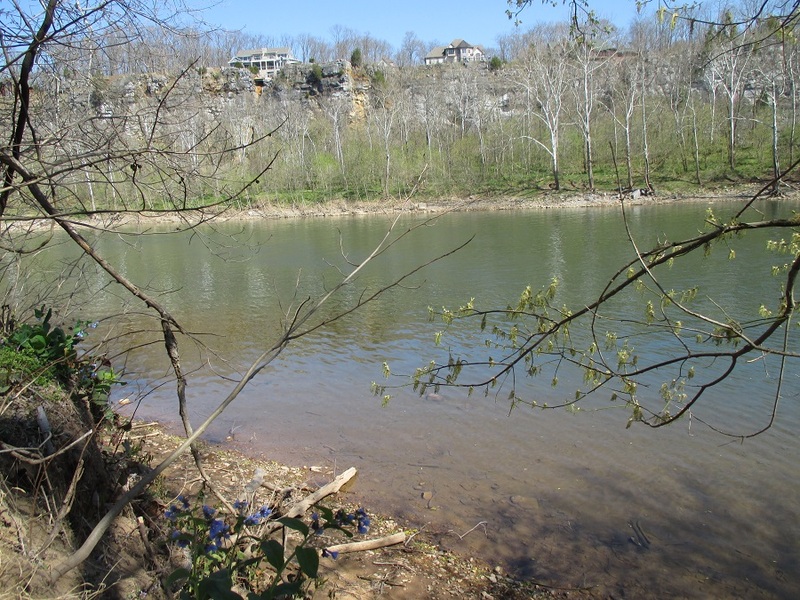 This is the uppermost one--number 50 (fiftieth one since leaving the Potomac River at sea level in Washington DC). Then it was 'goodbye' to the C&O as I walked a mile of the WMRT. This is a paved alternative to the C&O, preferred by most bikers. 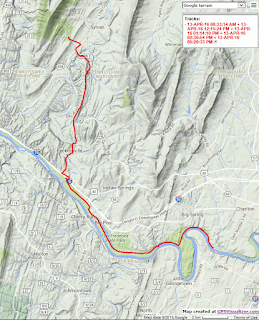 It parallels the C&O for its entire length (22 miles). I used it to connect to the Tuscarora Trail, although I didn't need to use it at all. Using it probably saved me 100 yards. Then it was on to the Tuscarora Trail. It was mostly a road walk today, connecting to the long narrow ridge of Tuscarora Mountain, which I'll hike tomorrow. But part of the road walk was on a peaceful dead end road in a state game land. Soon after this I crossed the Mason-Dixon line on a short bit of closed road beyond the dead-end and began hiking across Pennsylvania. The road walk ended at the foot of Tuscarora Mountain after crossing a quiet pastoral valley. Plans are to hike all the way across Pennsylvania south to north on the GET and connect with the Finger Lakes Trail in western New York. But that's "way down Yonder" We'll see if I get there. But 'til then I'll just go. 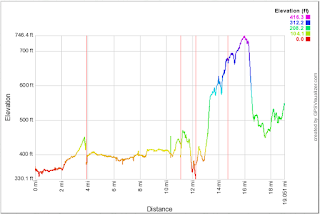 Here's the elevation profile for today's hike.